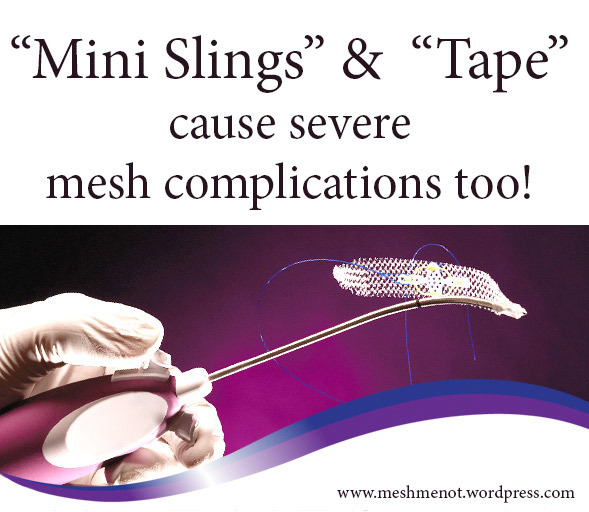 Not too long ago, a doctor told me that mini-slings used for SUI, or “tape” (as many now call the mesh slings), are not causing any of the mesh complications we are hearing about. I disagreed. While I did not have a mini-sling (I had a TOT), I tried to explain that I knew of women with the mini-slings also suffering horrendous complications. After all, it is made of the same polypropylene material that can (and does) harden and erode/cut through tissues, urethra’s, and more. I had talked to many in support groups for people suffering from mesh complications, and they were going through the same kinds of erosion and painful complications as many others in those groups. I also said that it was easy enough to go to the FDA MAUDE database and run a search to see that mini slings/tape, are also having many reported complications. But no, this doctor was convinced I was wrong and he was right. He was actually not very nice about it at all. He completely believed, like many doctors apparently do, that mesh complications were only from mesh kits used for POP, and NOT the small tapes or slings for SUI. He was wrong. INTRODUCTION AND HYPOTHESIS: Single-incision mini-slings (SIMS) have been advocated to avoid the complications of transobturator and retropubic midurethral slings. We present a series of SIMS complications and their outcome after vaginal removal at a tertiary care center. METHODS: Following Institutional Review Board approval, a prospective database of consecutive women who underwent SIMS removal for complications and had a minimum follow-up of 6 months was reviewed. Patient-reported outcomes were assessed by main symptom category. In addition, an ideal outcome or cure was defined as continent, pain-free, sexually active if active preoperatively, and not requiring additional medical or surgical therapy. RESULTS: Of 23 women, 17 met inclusion criteria. Presenting symptoms were varied but dominated by incontinence (14), pelvic pain (11), dyspareunia (10), and obstructive urinary symptoms/urinary retention (5), with 76 % presenting with more than one complaint. Type of SIMS included MiniArc™ (11), Solyx™ (4), and TVT-Secur™ (2). At a mean follow-up of 17 ± 9 (range 7-44) months after SIMS removal, six (35 %) women were cured of their presenting complaint. Among the 11 women with pelvic pain, 6 had resolution of pain, 2 improvement, and 3 persistent pain. Six of seven women who were sexually active beforehand resumed sexual activity. Dyspareunia persisted in three women. Of 14 with incontinence, 8 had cure or improvement, and obstructive symptoms resolved in 4 of 5. CONCLUSIONS: This series outlines several complications with SIMS, similar to what has been reported with other suburethral synthetic tapes. Therefore, caution is required and patient counseling is important. This also ties back into the faulty belief that mesh for SUI is ok, and it’s only the mesh for POP that is risky. The truth is, they are all made from the same polypropylene plastic material, and there are almost as many reported complications from SUI mesh surgeries, as there are from mesh used for POP. I really hope doctors start to wake up to this fact soon. “the jury in the product liability trial of Perry v. Ethicon finally decided for the plaintiff, Coleen Perry and awarded her $5.7 million. Ready set publish. The womens rights movement was big! tv ads list all possible side effects and hand you the list of them with every prescription. This must get into the hands of every individual considering mesh. It should be a law to protect human rights. Info MUST become available in doctors offices nationwide. Why or why not? Famy favorite line. Mesh makers should not be concerned by this. Mfgrs of pills aren’t it’s old news. Let people choose fairly. Had a full hysterectomy in 2002. My uterus was attached to my bladder w scar tissue from a previous tubligation years before. My dr said she use something called tape to keep frommy bladder having scar tissue to attach to it. Many complications on the cuff area and also got a severe abcess n took around 6 weeks to clear infection up. Any suggestions? melodie – tape is another word for mesh. =( If you are still suffering with pain and infections, it could be eroding and I would suggest finding a way to one of the few docs that specialize in mesh complications and removal.